Strong debate continues regarding the stormwater fee ordinance proposed by the town of Moraga. 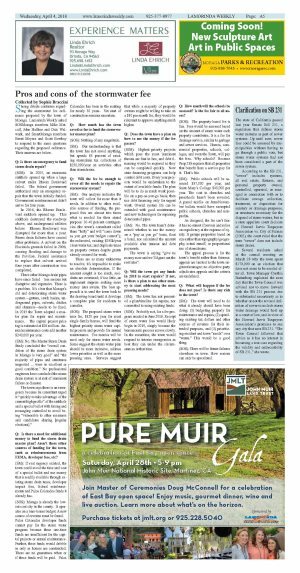 Lamorinda Weekly asked SOSMoraga members Mike Metcalf, John Haffner and Dale Walwark, and SmartMoraga members Brent Meyers and Scott Bowhay to respond to the same questions regarding the proposed ordinance. Their answers are below. Q: Is there an emergency to fund storm drain repair? (SOS): In 2005, an enormous sinkhole opened up when a large culvert under Rheem Boulevard failed. The federal government authorized only an emergency repair that the town initially funded. Government reimbursement didn't arrive for four years. In 2016, the Rheem Boulevard sinkhole opened up. This sinkhole destroyed the roadway above, and underground utilities below. Rheem Boulevard was disrupted for more than a year. Storm drain failures have caused other problems. A culvert on the Hacienda grounds failed in 2006, causing flooding and damage to the Pavilion. Federal assistance to replace that culvert arrived four years after construction was completed. Three other Moraga drain pipes have since failed - less serious but disruptive and expensive. There is a problem. It's clear that Moraga's old and deteriorating storm water system?gutters, catch basins, underground pipes, culverts, ditches and channels?needs to be fixed. In 2015 the Town adopted a master plan for repair and maintenance. The capital project price tag is estimated at $26 million. Annual maintenance costs add another $240,000 per year. (SM): No. The Master Storm Drain Study concluded the "overall condition of the storm drain system in Moraga is very good" and "the majority of pipes and structures inspected ... were in excellent or good condition." No professional engineers have concluded the storm drain system is at risk of imminent failure or disaster. The town says there is an emergency because its consultant urged it "quickly to take advantage of the current high profile" of the sinkhole and a special ballot with timing and messaging controlled to avoid being "vulnerable to other measures and candidates sharing [regular elections]." Q: Is there a need for additional money to fund the storm drain master plan? Aren't there other sources of funding for the town, such as reimbursements from FEMA, developer fees, etc? (SM): If real urgency existed, the town could avoid the time and cost of a special ballot and use money that is readily available through existing storm drain taxes, developer impact fees, federal reimbursements and Palos Colorados funds it already has. (SOS): Moraga is already the lowest-cost city in the county. It operates on a bare-bones budget. A new source of revenue must be found. Palos Colorados developer funds cannot pay for the storm water program because these one-time funds are insufficient for the capital projects or annual maintenance. Further, these funds would dribble in only as houses are constructed. There are no guarantees when or if these funds will be paid. Palos Calorados has been in the making for nearly 30 years. Yet start of construction remains uncertain. Q: How much has the town saved so far to fund the stormwater master plan? (SOS): Nothing of any magnitude. (SM): Our understanding is that the town has not saved anything, but spends 85 percent of existing stormdrain tax collections of $250,000/year on activities other than stormdrains. Q: Will the fee be enough to cover all the needs to repair the stormwater system? (SM): Our analysis indicates the town will collect far more than it needs. In addition to other available sources of funding, the proposed fees are almost two times what is needed for their stated purpose: 30-40 percent contingencies (the town's consultant called them "hefty" and will "come down as you get your budget correct"); the redirected, existing $250k/year clean water tax; and duplicate taxes on property owners despite grants already secured for work. There are so many unknowns to resolve, it's impossible to make an absolute determination. If the amount sought is too much, residents are overtaxed; if too little, an unpleasant surprise seeking more money later awaits. The best approach is to send the town back to the drawing board until it develops a complete plan for residents to consider. (SOS): The proposed storm water user fee, $120 per year for most single-family homes, will fund the highest priority storm water capital projects and provide for annual maintenance. Fee monies will be used only for storm water needs. Some suggest the storm water plan should be more inclusive, address lower priorities as well as the more pressing ones. Surveys suggest that while a majority of property owners might be willing to take on a $10 per month fee, they would be reluctant to approve anything much higher. Q: Does the town have a plan on how to use the money if the fee passes? (SOS): Highest priority projects which pose the most imminent threats are first in line, and debt financing would be required so they can be completed quickly. New state financing programs can help control debt costs. Every year projects would be undertaken to the extent of available funds: The plan will be to do as much work possible on a pay-as-you-go basis; then use debt financing only for urgent work. Overall system life can be extended with good maintenance and new technologies for repairing deteriorated pipes. (SM): No. The town hasn't determined whether to use the money on a "pay as you go" basis, float a bond, nor calculated the amount available after interest and debt payments. The town is saying "give us money now and we'll figure out the rest later". Q: Will the town get any funds in 2018 to start repairs? If not, is there a plan to use other money to start addressing the most pressing needs? (SM): The town has not presented a plan/timeline for repairs, nor committed to using existing funds. (SOS): Probably not, for a fee program enacted in June 2018. Receipt of storm water fees would likely begin in 2019, simply because the bureaucratic process moves slowly. In the meantime, the town would respond to interim emergencies as best they can under the circumstances at that time. Q: How much will the schools be assessed? Is the fee fair to all users? (SOS): The property-based fee is fair. Fees would be assessed based on the amount of storm water each property contributes. It is a fee for drainage service, similar to garbage and sewer services. Homes, commercial properties, schools, colleges, and even the Town, will pay the fees. Why schools? Because Prop 218 requires that all properties that benefit from a service pay for it. That's fair. (SM): Public schools will be assessed $37,000 per year, and Saint Mary's College $40,000 per year. The cost to churches and preschools hasn't been revealed. A parcel tax/fee on June/November ballots would have exempted public schools, churches and non-profits. As designed, the fee isn't fair: it has no sunset (forever) and relies on expediency at the expense of equity. It groups properties based on size rather than topography/geography, actual runoff, or proportional use of stormdrains. The appeal process is for the town's benefit rather than fairness: appeals are limited to the town engineer/manager; no objective party adjudicates appeals and the criteria are undefined. Q: What will happen if the fee does not pass? Is there any risk to the town? (SM): The town will need to do what it already should have been doing: (1) budgeting properly for maintenance and repairs, (2) spending existing tax dollars and other sources of revenue for their intended purposes, and (3) prioritizing resident and town "needs" over "wants." This would be a good thing. (SOS): There will be future failures elsewhere in town. How serious can only be speculated. The state of California passed last year Senate Bill 231, a regulation that defines storm water systems as part of sewer systems. Up until now, sewer fees could be assessed by municipalities without having to go through a public vote, but storm water systems had not been considered a part of the sewer system. According to the SB 231, "sewer" includes systems, all real estate, fixtures, and personal property owned, controlled, operated, or managed in connection with or to facilitate sewage collection, treatment, or disposition for sanitary or drainage purposes, or structures necessary for the disposal of storm waters, but in a state appellate court decision of Howard Jarvis Taxpayers Association vs. City of Salinas (2002), the court ruled that the term "sewer" does not include storm drains. Several residents asked at the council meeting on March 28 why the town spent $170,000 on an election that does not seem to be needed after all. Town Manager Cynthia Battenberg explained the next day that the Town Council was advised not to move forward with the SB 231 process due to substantial uncertainty as to whether or not the revised definition of sewer to include storm water drainage would hold up in a court of law, and in view of the Howard Jarvis Taxpayers Association's promises to sue any city that uses SB 231. "The Town Council followed that advice as it has no interest in becoming a test case regarding the validity and enforceability of SB 231," she wrote.